Bermuda grass killed by Roundup, a very fast surface -- if packed and rolled, it would make a crunchy sound underfoot. Penn State Turfgrass seeds on the NASA Shuttle. The normal color of well-watered Bermuda in the middle of the growing season -- a fairly slow surface, nice and lush and spongy. Green speed is much more than just mow height and grass type -- and much of green speed is related to the water content of the green and it's turf packing. Green speed is more than grass type or mowing height, and is also a matter of moisture and surface preparation. The Bermuda greens at Augusta National, before the grass was switched to bent in the 1980s, were extremely fast even without being closely shaved bent. The trick was to pack and roll the dried Bermuda until the green surface was "crunchy." Literally. Golfers described the greens as making a sound when you walked onto them that sounded like walking on stiff celophane with spikes on. This, in an exaggerated fashion, teaches the value of the feet for reading green speed. Dry is fast because dry is thin blades without water and dry is not springy blades that cushion and resist the roll of the ball. When grass is dry, it generally loses some of the "blue" component of its color, so lush moist grass is deep green and drier grass has more yellow even to tawny colored. Supers prepare greens for tournament play by carefully scheduling the watering to balance the natural requirements of grass for water against the need for speed. PGA Tour and US Open greens frequently have the water requirements of the green only minimally satisfied, which tends to stress the green's health. The trick is to start with a very healthy green and stress it to the appropriate extent and timed so that its stressing peaks during the days of the tournament. That usually means little greens water during the four days of play, with increasing speed from Thursday to Sunday, unless the weather fails to cooperate and reduces the course to a game of darts where approaches all stick. Occasionally, the greens start out too fast for fair play, and pros during the practice and pro-am rounds complain, so that the super increases the watering in order to reel the green speed back in. Packed and rolled is fast because it is an artificial way of flattening and lowering the grass against the underlying turf and also flattening and packing the turf itself. There has been some concern about how much packing and rolling greens can stand, but the current understanding is that a well-designed green can pretty much handle frequent rolling. 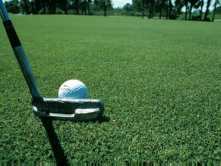 Because of this, supers roll the greens leading up to tournaments, and this tends to eliminate many surface irregularities that accumulate during normal play and maintenance, make the greens slightly less amenable to water absorbtion, and press the grass flatter than otherwise. There are scientific "thumpers" to judge the degree to which a green is "hard" for approach shots, and the pros are keenly aware of these subtleties. So, the top putter is consciously atuned to fine gradations in green moisture content and surface compaction as these factors affect the speed of the green. This is partly a matter of looking at the grass for its lushness or spareness, its wetness or dryness, and its color for uniformity and hue. Judging green speed is also a matter of feeling the green with your feet, in terms of sponginess or crispness and depth of grass. And it is also a matter of taste and smell (which are very closely allied senses). If the green is recently mowed, the clippings have one smell if they are moist and another if they are dry. Moist soil also has one smell, and dry dirt another. This smell is a chemical composition of water, dust or dirt, and other chemicals from the green that are in the air, and the air also has a taste when it meets the taste buds. This "smellable" air is more potent on warm days with a gentle breeze, as the heat and breeze stir the smell up off the surface because of evaporation and because hot air rises and moves around more energetically than cold air. In general, the more potent the smell and taste, the more likely the green's mositure content is up. The lesson is: You probably know most of this tip "instinctively" to some extent, but it is even better to use your instincts on purpose, so you don't forget how they can help you. When you walk on the green, pay attention to your feet and the taste and smell of the air -- not just the appearance of the grass. Your speed control will thank you, and your learning curve for that round will be shortened considerably. 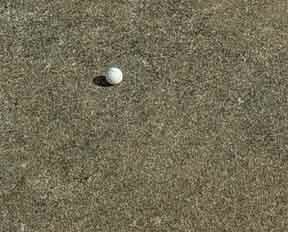 For more tips and information on putting, including a free 10,000+ database of putting lore and the Web's only newsletter on putting (also free), visit Geoff's website at http://www.puttingzone.com, or email him directly at geoff@puttingzone.com.